All eyes in Epcot are on World Showcase Lagoon in 2019, because IllumiNations — the beloved fireworks, laser, and light show — is scheduled to end in the second half of the year. And to make the most of the final nights of the show, Rose & Crown Pub and Dining Room in Epcot’s United Kingdom is now offering Illuminations Dining Packages! Tonight is the first official night of this dining package which includes three courses and a patio seat for the big show! 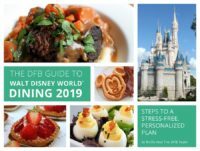 And thanks to DFB’s Travel Agent partner, Small World Vacations’ Sue P., who happened to get a preview last night — we’ve got everything you need to know about this unique dining experience BEFORE it officially begins! 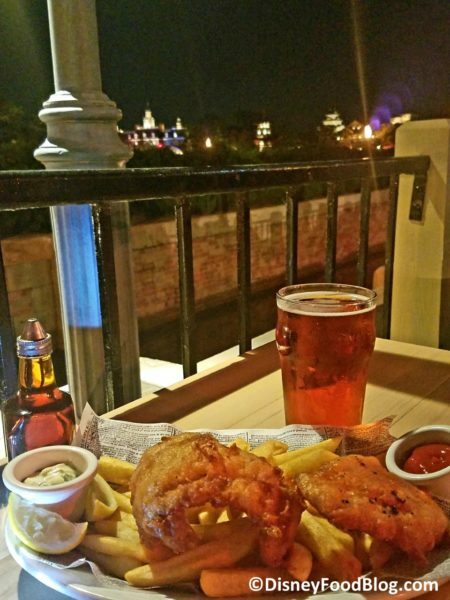 The IllumiNations dinner takes place on the patio at Rose & Crown, giving diners a sweeping view of World Showcase Lagoon (and IllumiNations!). The venue for this special event holds about 40 guests. 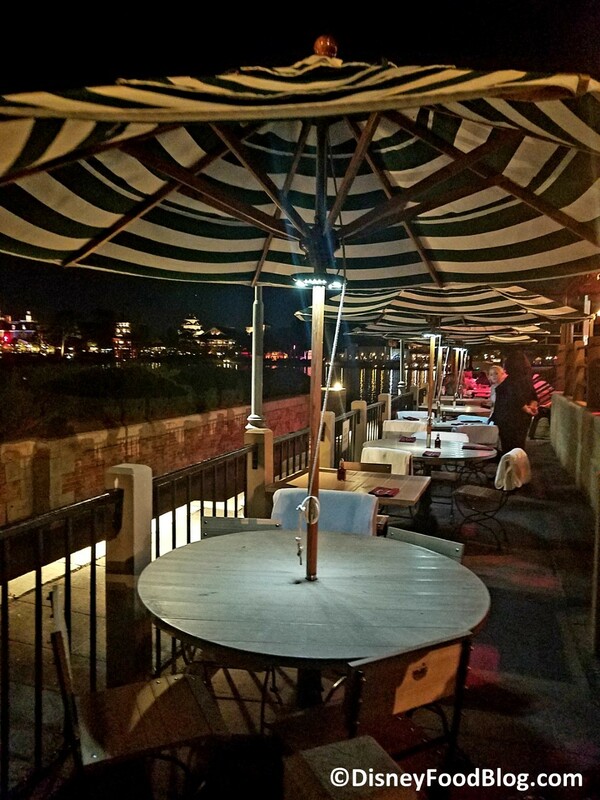 And while patio seating is guaranteed for diners who’ve purchased the package, we’re told there will still be some limited space for other diners who time their meals just right! 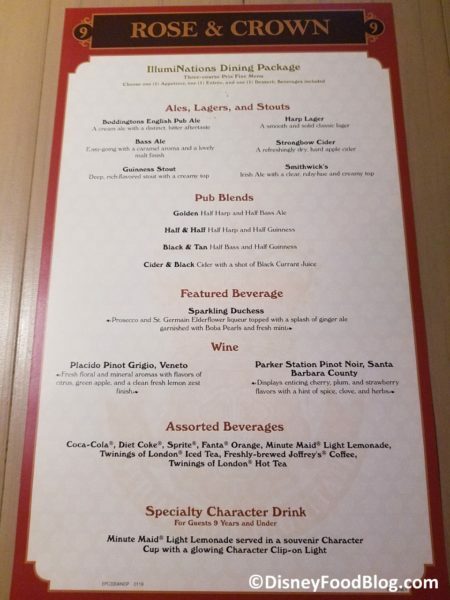 The prix fixe menu for IllumiNations is a three-course dinner featuring some of Rose & Crown’s most popular menu items. 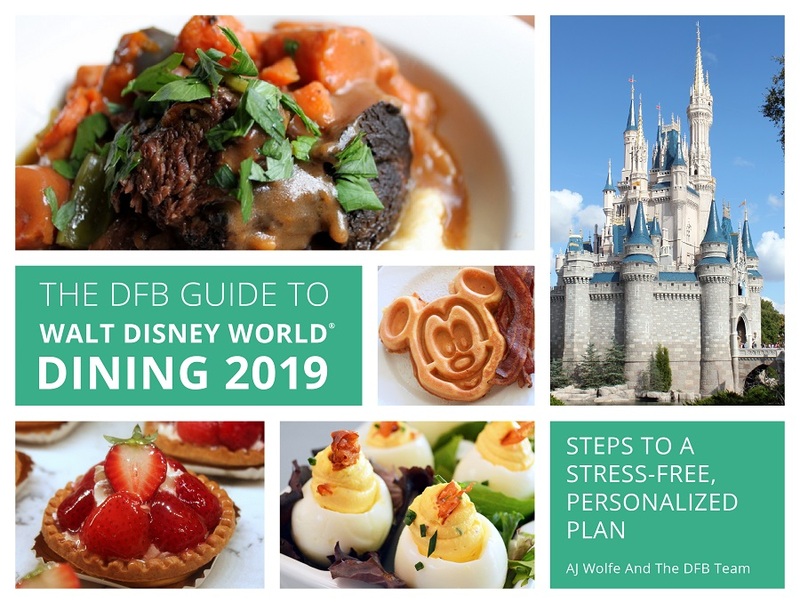 Unlimited alcoholic and non-alcoholic beverages are included in the dining package, and for this there is a full menu that includes the event’s signature beverage – the Sparkling Duchess. 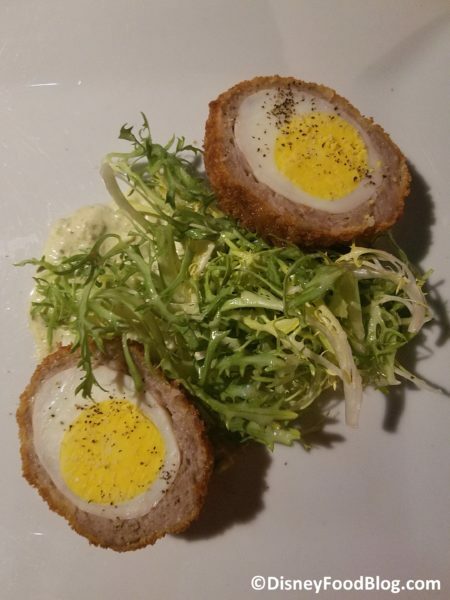 Dinner begins with a choice of an appetizer: Rose & Crown’s famous Scotch Egg or a traditional Cheese Platter. We actually love BOTH of these, so either one is a perfect choice. 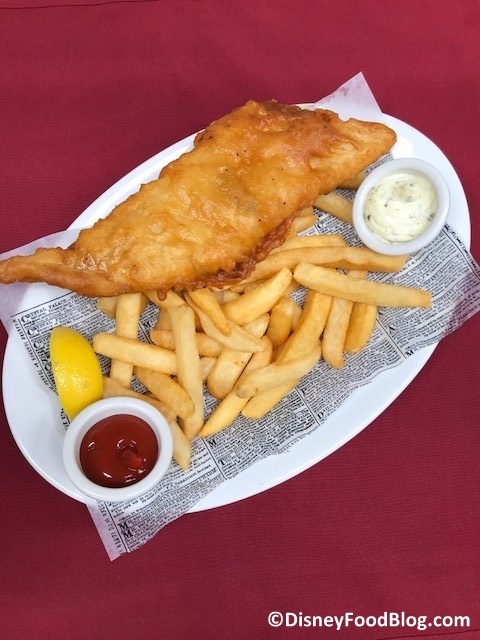 These are followed by a choice of entrées such as Rose & Crown’s signature Fish and Chips, served with ketchup and tartar sauce. This is an excellent and authentic choice. If you’re looking for some real comfort food from across the pond, Corned Beef and Hash is a terrific choice. If you’re aiming to eat healthy, consider Pan-Roasted Scottish Salmon with lots of vegetable sides. And finally, what’s a British menu without Bangers and Mash? Ooh, we are ready for it! 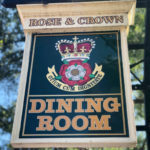 This is almost always my choice at Rose and Crown! 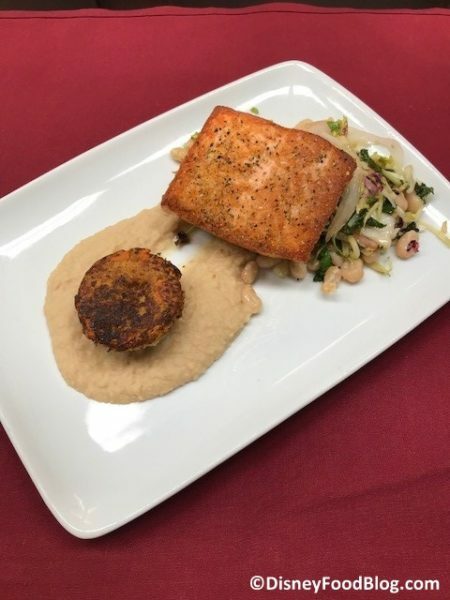 It’s delicious, savory, and just the right portion size. 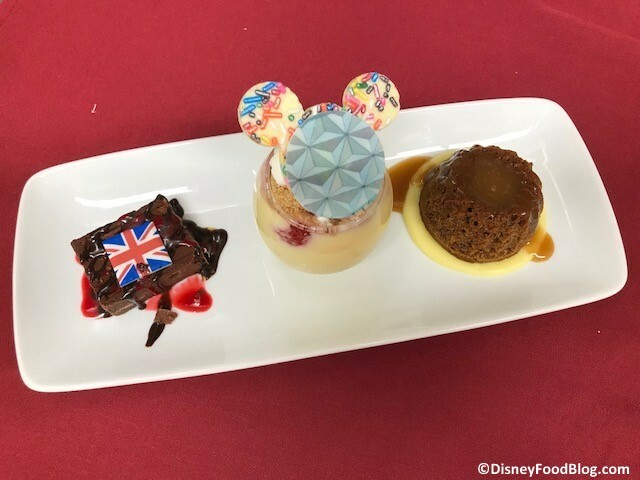 Dessert is the Pudding Platter Trio featuring Sticky Toffee Pudding, English Trifle, and Chocolate Nougat Bar. Such a fun way to try several English classics all at once! Kids participating in the dining package can enjoy a soup (including the yummy Potato Leek Soup!) or salad with their choice of Cheese and Turkey Flatbread, Turkey Meatball Pasta, Cheesy Pasta, or Fish and Chips as well as either Fruit Salad or Trifle for dessert. And, of course: the view. This is a beautiful way to end the day at Epcot! The IllumiNations Dining Package officially begins tonight, and booking is available via the Disney World website or by calling (407) WDW-DINE. The price is $85 for adults and $35 for children (tax and gratuity included). Epcot admission is required but not included. Huge thanks to Sue for sharing these photos with us! 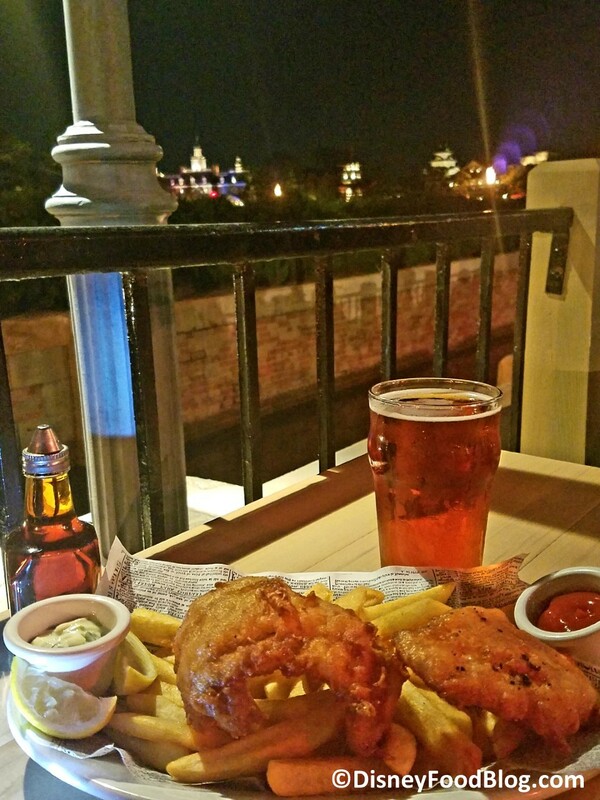 Are you making reservations for the IllumiNations Dining Package at Epcot? Let us know in the comments. 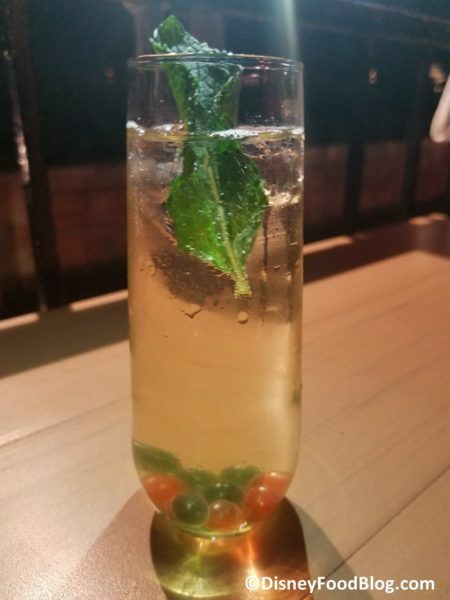 Are there allergy friendly options? Or vegan? Yes Kim, we offer the Vegan Bangers and Mash and the Vegan Fish and Chips, upon request. The Chefs will always work with the guests in regards to allergy friendly options and special dietary needs. Any idea if Tables in Wonderland is accepted? Thanks for the quick review! 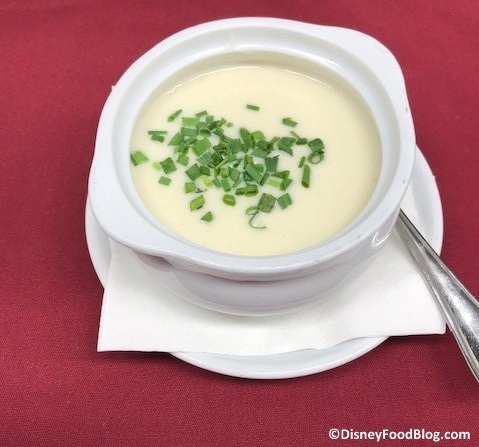 Can an adult diner order the potato leek soup as an appetizer ? Neither the scotch egg or cheeses are appealing in the SLIGHTEST to anyone in my family!! Not booking this if we can’t substitute something else for those two appetizers. Thanks for any info! Laura, we can’t say for certain, but we’d expect yes. You could try calling the restaurant directly (1 407-939-3463) to see if they will! I’m hoping we can get a reservation for this for our August trip! Waiting for ADR day is excruciating! What are the thoughts on the difficulty of getting this reservation? Samantha, agreed on playing the waiting game! As for how difficult, there were about 40 diners the night our pal attended, so that’s pretty limited. Try for it as early as you can on day 180! Hi, hoping to book this for our trip in August. We are a party of 6 with one finicky eater. Is there anyway to make any modifications to the set menu that would appeal to her? Thank you! Christine, typically Disney table service restaurants will accommodate. That this experience has set menu might affect that, but honestly I would expect them to take care of you. 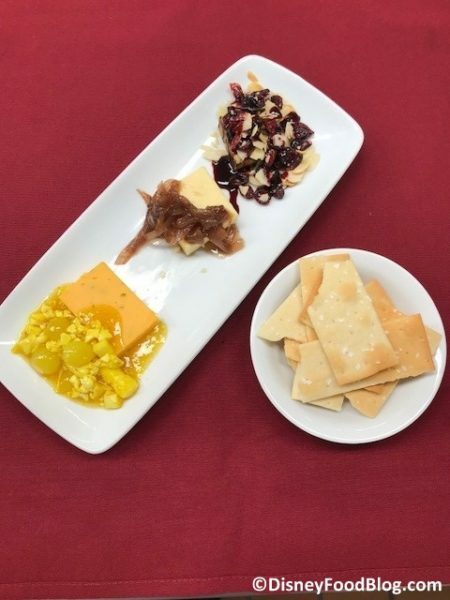 There are some simple dishes on the kids’ menu that might appeal to a picky diner of any age (and they might adjust portions for you if your finicky eater is an adult). 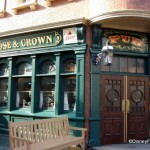 Call Disney dining (407) 939-3463)to inquire; maybe they can confirm this for you! 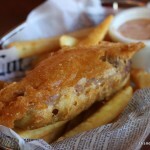 $85 for fish ‘n’ chips?! Dood, I think guests who choose to attend are considering it for the experience of watching IllumiNations from this location. 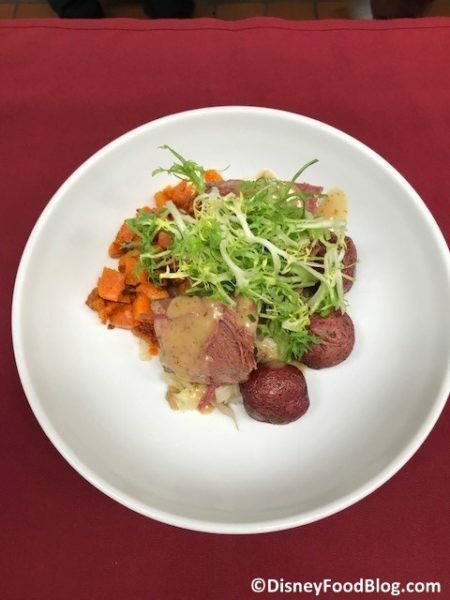 The Crock of Potato Leek soup is officially on the menu for this event now. 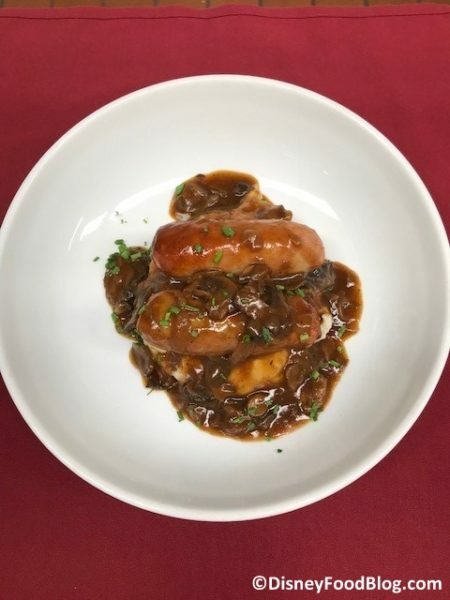 Bangers and Mash simply sausage and mashed potatoes?? Beef gravy overlay?? Sue, that’s a tough one. 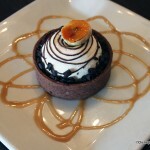 Usually when they create a menu for a dining experience, they do accommodate those who can’t eat anything on the menu. Whether or not you could request a specific different dish, I’m just not sure. 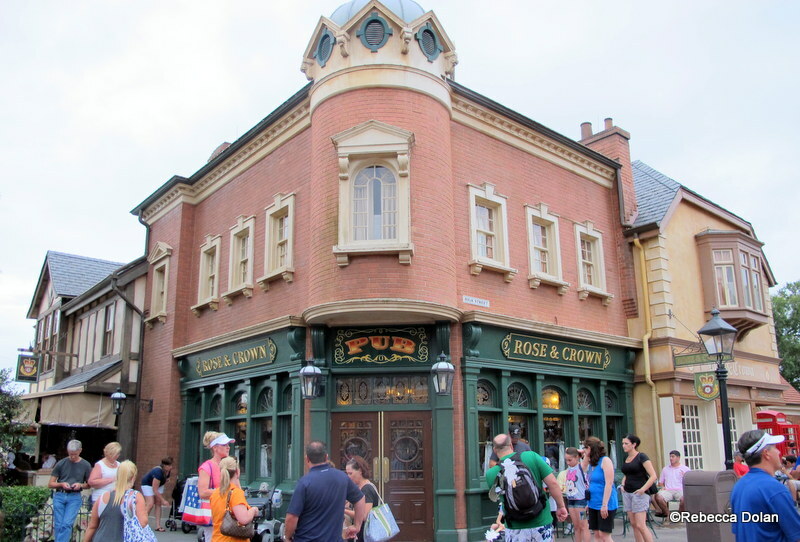 You could try calling Disney dining to see if they can give you a definitive answer. 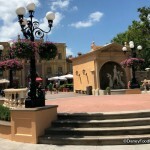 Any idea how the view is for the actual Illuminations show? I read in one review that the dining package is on the lower patio which has lots of tall hedges blocking a lot of the stuff on the water. Diners on the upper patios of the restaurant supposedly get a better view. Good afternoon… is there a 1-800 number to call for questions about the illuminations show and to make reservations. Also if you make reservations to the illumination show can you request to sit upstairs for the best view? Thankyou. ..
Sue, you can make a reservation for the party by calling 407-939-3463. When you do that, check into whether or not you can request a certain patio or seat. Manuel, it seems like a party of two should be workable, but contacting Disney directly might be your best bet. If a phone call is too difficult, can you try the chat feature? Manuel, I just chatted with Disney to see what they’d say. The representative I spoke with said that ADRs for two are possible but that tables are limited, so there may be no more two-person tables available for the time you’re searching. Hopefully the Moms Panel will help! Manuel, I checked with AJ on your question. She says to make your ADR for three, if you can find one, and keep checking for a two-person ADR in the meantime. I hope this helps!